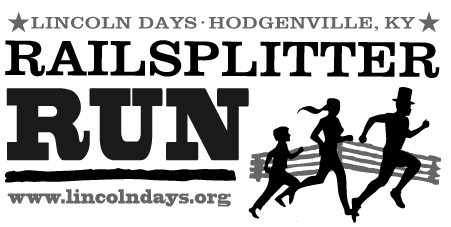 Railsplitter Run 5k & 10K | Lincoln Days Celebration, Inc.
Join us for the 38th Annual Railsplitter Run on Sunday, October 7. 5k and a 10k Races start at 8.am. The race begins & ends at 201 W. Main Street in downtown Hodgenville. Participation is open to all. Runners will begin on Main Street by the post office. Runners will head west on Main Street to Water Street. Runners will run on Water Street to Lincoln Blvd. Runners will head north on Lincoln Blvd. Runners will turn left on Tonieville Road connecting to the bypass. Will run a double-loop of the 5k (above). ALL DECISIONS AND AWARDS ARE FINAL.